Johnny Cash is an American icon, so it only makes sense that the untold story of the man behind the Man in Black is the story of a Canadian. The late Saul Holiff, reserved and modest(ish), receives a posthumous tribute from his son, Jonathan, who mines the archive of his father's life in the folksy documentary My Father and the Man in Black. This personal Canada production, which screened at the Ottawa International Film Festival on Friday, walks the line between sweetness and sentimentality, but Holiff provides both an intimate tale of fathers and sons and a revealing glimpse into music history. A get deal of the material in My Father and the Man in Black comes from a hidden locker that houses Saul's secrets until Jonathan's mother hands over the key in the days following Saul's death. The locker holds a wealth of valuable pieces of rock and roll history. It’s stuff that Jonathan vehemently denies exists to interested collectors and journalists, including gold Johnny Cash records congratulating Saul on selling a million records. The real nuggets hidden away, however, are boxes of audio diaries that Saul recorded during his years as Cash's manager. 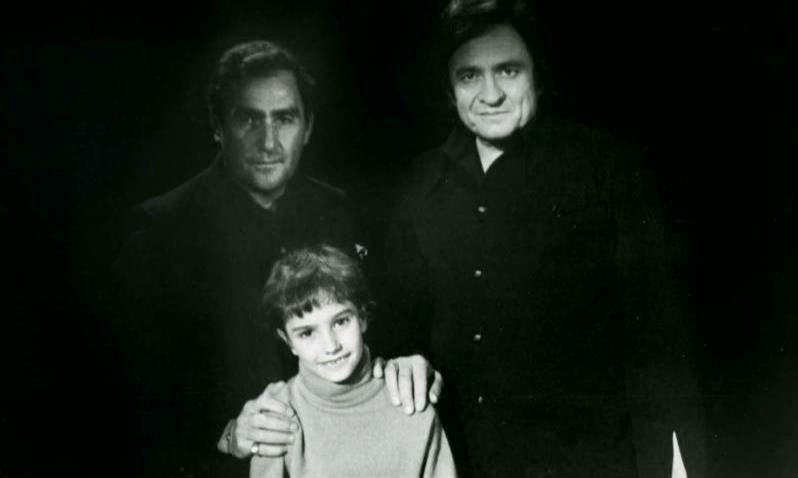 The story that Jonathan Holiff narrates using his father’s diaries and ample correspondence between Saul and Johnny Cash reveal a much different, and far less flattering, portrait of the Man in Black than that which exists in rock and roll folklore, biographies, and movies. Cash admittedly receives a comparatively balanced portrayal in the warts-and-all biopic Walk the Line that feature Joaquin Phoenix as Cash and Reese Witherspoon in an Oscar-winning performance as June Carter Cash, but My Father and the Man in Black shows a Cash undone not simply by drugs, booze, and women, but also by religious fanaticism and personal megalomania. My Father and the Man in Black receives a note of significance in the introductory preamble to Saul’s life when Holiff explains that he father didn’t even receive a role for a bit character to play in Walk the Line and went unmentioned in the most widely consumed story of Cash’s success despite being a key figure in the years dramatized in the film. Saul’s is to Walk the Line what Ken Taylor is to Argo, and My Father in the Man in Black, like the Taylor-focused doc Our Man in Tehran, sets the record straight by giving a pivotal figure his due. My Father and the Man in Black lacks the urgency and finesse of the Taylor doc, but it’s nevertheless an enjoyable snippet of music history. This behind-the-scenes exposé reveals the pressures and personal sacrifices made to ensure the success of others and Holiff’s portrait shows that the hardest workers of the business, those behind the cameras, often go unsung. Holiff spends a great deal of the film getting to know the father he missed, for Saul spent much of Jonathan’s early childhood on the road with Cash. As Holiff notes in his plain, movie-of-the-week voiceover, he was born just before Saul was working with Cash on his landmark Folsom Prison album. “How could a nine month old baby compete with that?” he asks. The film notes that Saul made it back to London, Ontario for the births of both his sons, though, so Holiff reflects upon his father admirably and favourably by seeing how hard he worked to balance his commitments in a demanding career. My Father and the Man in Black frequently constructs a dialogue between Saul and Cash using the aforementioned correspondence, and Holiff shows the camaraderie between the two while also showing the dogged struggle Saul faced in dealing with the consequences of Cash’s substance abuse that frequently made him a nightmare to sell, book, and manage. Much of this earlier section of the films is familiar, even to a viewer without much knowledge of Cash beyond Walk the Line and his appearance on “Sesame Street,” so My Father and the Man in Black covers usual terrain in its first half. It simply takes a different route. The film becomes far more interesting, however, when it reaches the point of Cash’s career that deals with his bizarre religious fanaticism and how he tried to balance it with his persona as the rugged Man in Black who “shot a man in Reno just to see him die.” The excerpts of Cash’s self-financed Biblical film Gospel Road, in which he narrates the story of Jesus Christ while touring Israel and singing songs, are downright hilarious. This sequence also introduces the personal rifts between Saul and Cash as Holiff muses over the shame his father must have experienced while being cast in the role of Caiaphas, a Jewish priest who plays a role in condemning Christ to death, during Gospel Road. Saul, a Jew, wonders if Cash is making a personal dig at his manager who wishes the star would measure his piousness in the public light. This scene is one of the few moments in which Holiff interprets the material he explores from his father’s archive, and it’s undeniably intriguing to watch the footage twice through different filters. My Father and the Man in Black offers perspectives that should appeal mostly to music fans eager to discover untold stories of the popular icon, but the film too frequently strays into a sappy tip of the hat to an absent father. Much of the film also features awkwardly shot dramatic re-enactments to accompany Holiff’s narration or Saul’s audio diaries, which is occasionally frustrating since one can presume a great deal of available material exists, although one can also appreciate Holiff’s reluctance to use Walk the Line when it downright rejects his father’s existence. These frequent re-enactments are just a bit too hokey in their execution and brightness, although they might play far better on smaller home video platforms than on a large theatrical screen. (The film is actually widely available on home video.) Holiff nevertheless assembles a great deal of archival material, for the rare photographs and correspondence are a treasure trove for cultural junkies, and Holiff’s narration offers enough personal anecdotes to make the material relatable and accessible. My Father and the Man in Black is a bit too personal, but its down-home character makes it personable, too. My Father and the Man in Black screened at the Ottawa International Film Festival on Friday, Oct. 17 at the Mayfair Theatre.